The Friends of Fort Erie’s Creeks introduces a new conservation initiative that will see habitat added in and around our creeks throughout Fort Erie. The Friends of Fort Erie Creeks introduces a new conservation initiative that will see habitat added in and around our creeks throughout Fort Erie. This is not a new program however how we deliver it will be. 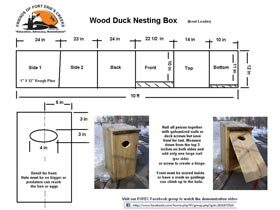 The nesting boxes need maintenance and many need replacing so instead of asking for donations to purchase the boxes we’ve decided to make them ourselves and allow businesses and residents to “sponsor” a nesting box for the approximate cost of materials. 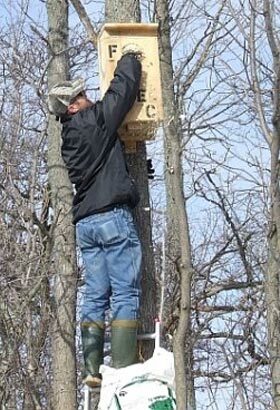 Only 20 sponsored wood duck nesting boxes will be made available. Additional boxes can be purchased and brought home with proceeds going to FOFEC initiatives. Prices are listed below or you can make a nesting box from our plans and donate it and we will recognize your contribution on our website. You may only sponsor one box. We want more people to appreciate the health of our creeks and wetlands where wood ducks raise their young. For $25 or a donation of a homemade box we will hang your sponsored box in a predetermined location. With your permission we will label it with your (business) name and send an annual report with a picture and GPS coordinate via e-mail. Most boxes will be placed in view so that they can be viewed with binoculars from the road or trail side. You can also share your photo on our facebook group. You may take your purchase home for $50 with all proceeds going to FOFEC initiatives. 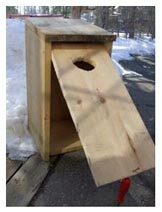 Screech owls, squirrels and other wild life also enjoy the raising their offspring in the duck nesting boxes. 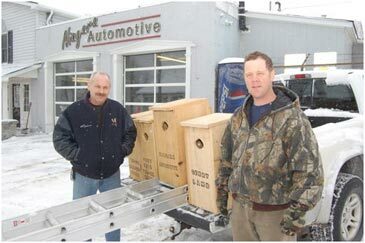 Mike Hebbourn, of Niagara Automotive, receiving his duck nesting box from Friends of Fort Erie's Creeks member Dan Andrews.